Managing Director Adrian Moore, who is a Fellow of the Institution of Mechanical Engineers (IMechE), hosted a visit to Xtrac by Jon Hilton, President of the IMechE, on Wednesday 22nd February 2017. Accompanying Jon Hilton were John McCarthy – Chairman of the Thamesway region, Jenny Stroud – Chairman of the Reading Area, and Alan King – Business Development Manager for the IMechE. Xtrac is renowned for developing the next generation of engineers, and works closely with the IMechE and the local Reading and Thamesway membership. Two of Xtrac’s young engineers Adam James, and Megan Clarkson met with the group and discussed their career development at Xtrac. James who is an Associate Member of the IMechE , joined Xtrac in 2006 to undertake a year long industrial placement before being sponsored by Xtrac to complete his Master’s degree at the University of Hertfordshire. Now a Principal Engineer, James is working on transmission projects for Formula One and advanced electric vehicles. Clarkson, a student member of the IMechE, is studying for her degree at Oxford Brookes University and joined Xtrac in 2016 to undertake a year long industrial placement. She is currently leading a project to further improve Xtrac’s world class quality by minimising re-work, and spent some time with Jon Hilton and his group to explain the intricacies of the project, showing just why Xtrac’s award winning industrial placement scheme is so well regarded. 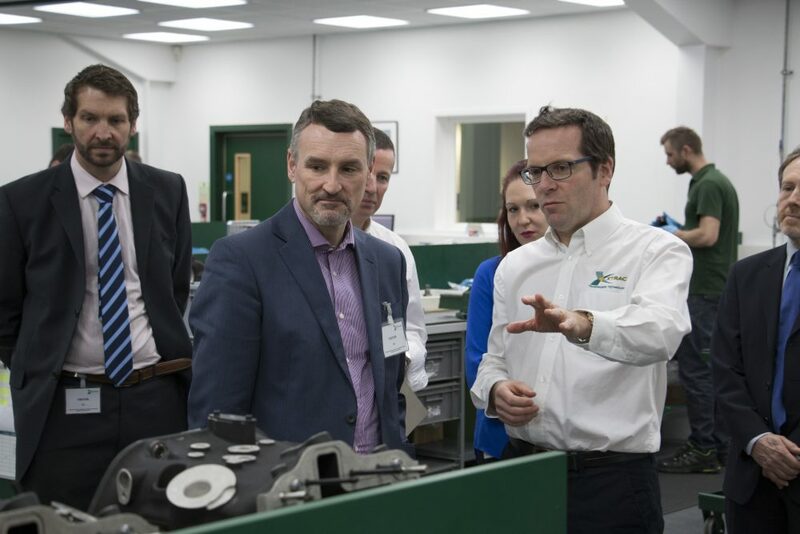 Xtrac’s Operations Director Martin Halley, a Fellow of the IMechE, led the group on a tour throughout the factory starting in the engineering office where an extensive team of engineers and analysts develop Xtrac’s latest generation of new gearboxes and differentials. Design Engineer and IMechE member Stuart Shaw explained the design process within Xtrac and described his current cutting edge gearbox project for an electric vehicle. The tour highlighted Xtrac’s latest investments in computerised machine tools in the turning, milling, gearcutting, grinding and heat treatment workshops before visiting the R&D testing department to meet IMechE member and Head of R&D Oliver Grant. The tour culminated in the transmission assembly workshop where finished gearboxes are built prior to delivery to Xtrac’s customers around the world and where Senior design Engineer and IMechE member Michael Allen described his role in the latest P1192 Hypercar transmission project. Further to the industrial placement undergraduate programme, Xtrac is proud to encourage new up and coming talent through our award winning apprenticeship scheme. During the tour Hilton and his group met with R&D technician Chris Burn, and Gear Cutters Martin Carrick & Roy Wilkinson who all started at Xtrac as apprentices and who are now very successfully working on the very latest machinery manufacturing Xtrac’s world renowned products. During the visit the support that the IMechE can provide was discussed. King outlined the help that the IMechE can give to organisations such as Xtrac to encourage professional development. Following the visit Adrian Moore remarked that “Jon Hilton and his group commented how friendly and enthusiastic everybody they met were and I am very proud to be able to show our fantastic facility and loyal workforce off to the IMechE President”. Engineering Manager Stuart Croot added “we look forward to continuing to work with John and Jenny, in particular to ensuring that we continue to engage with local IMechE members in order to continue to support and promote the engineering profession to our local community”. Adrian Moore (R) with Jon Hilton (L) in Build Shop. Michael Allen (L) Showing The P1192 Gearbox To Jon Hilton (R).